This is part three of a three-part fifteenth-anniversary retrospective of Buffy the Vampire Slayer. It contains spoilers for the entire run of the show. Continuing with my top 25 episode countdown, here’s the top ten. You’ll notice that I cheated a little and did a couple of two-parters as single episodes. Well, I did say that 20 percent of the show was 28.8, so if I have 27 favorites, you’ll have to forgive me. Notable Guest Stars: Richard Riehle as Merrick, since Donald Sutherland probably would’ve been too expensive; Julie Benz as Darla, the vampire who turned Angel. It Made The List Because: Which is more important to you? Do you save the man you love, or do you save the world? Buffy chose the world, and the pain of it is writ large on her face. Everything she knows is collapsing — Xander and Willow are hurt, Giles was tortured, Angel is dead, and, worst of all, her mother has turned her back on her. Gellar plays it beautifully. Synopsis: Throughout the season, Faith and the Mayor have been growing closer, becoming almost like father and daughter. Oz and Willow consummate their relationship. Faith poisons Angel, a poison which can only be cured by the blood of a Slayer. Buffy and Faith fight, and it ends with Buffy stabbing Faith, possibly fatally, and Faith falling onto a moving truck and escaping. The Mayor is quite upset over the fight — he really does care about Faith — and sends his minions to find her and Buffy. Buffy allows Angel to drink her blood so he can be cured. In a prophetic dream, Buffy and Faith seem to reconcile, although that’s only on a subconscious level. The Mayor, speaking at graduation, turns into a demon and starts wreaking havoc, including eating Principal Snyder. No one really complains. Buffy’s master plan — mobilizing the graduating class with weapons and using Xander’s military knowledge from Halloween — saves most of them. The other part of her plan is to lure the Mayor, now in demon form, into the library, where she detonates a large amount of explosives. The Mayor is killed and the school destroyed. Angel, as he promised, leaves Sunnydale (to get his own spin-off). Notable Guest Stars: Alexis Denisof as Wesley Wyndham-Pryce; Harry Groener as the Mayor. It Made The List Because: The conflict between Buffy and Faith comes to a head and we finally see who is the better Slayer. Also, Angel leaves Sunnydale despite the fact that he and Buffy are still in love. It was just a good season finale, satisfying in every regard… which makes sense, given that the main characters are now about to move onto the next phase of their lives: college. Synopsis: Oz returns to Sunnydale having learned control over his wolf side. He and Willow talk for the whole night, but when Tara arrives, she becomes uncomfortable and leaves before Willow can get back from the bathroom. Willow admits to Buffy that she’s getting serious with Tara. Spike makes a deal with Adam to get the chip out of his head. Oz is captured by the Initiative, but Buffy gets him out. Oz leaves Sunnydale again after talking to Willow — the two of them confess that they will always love each other — and then Willow goes to Tara. Tara blows out the candle. Notable Guest Stars: Leonard Roberts (Heroes) as Forrest Gates; Bailey Chase as Graham Miller; Amber Benson as Tara. It Made The List Because: It’s no secret that I’m a fan of the Willow/Tara relationship. Willow loves Tara because she’s Tara; it doesn’t matter that she’s a girl, or that she’s a witch, or that she’s a college student, or that she thought she was going to turn into a demon someday (don’t ask). Since I was a teenager I’ve always believed that you love who you love, regardless of what parts they have in their pants, and this relationship is about that. Plus, we get lots of Alyson Hannigan’s goofy smiles as a result — always a positive. Synopsis: Cordelia is pretty upset after Xander and Willow are discovered kissing — at the time, she was dating Xander — and she makes a wish while speaking to the new girl, Anya. Anya is really a vengeance demon, and Cordelia’s wish — that Buffy had never come to Sunnydale — becomes reality. We’re then shifted to an alternate reality where the Master won and Xander and Willow are vampires. Giles figures out that they’re in an alternate universe and they call in Buffy, who was in Cleveland (location of the other Hellmouth). Although Buffy, Angel, Willow, and Oz are killed, Giles defeats Anya by destroying the source of her power and trapping her in human form. The alternate universe disappears. Notable Guest Stars: Emma Caulfield as Anya, in her first appearance on the show. It Made The List Because: Mostly because of Willow’s “bored now!” line that comes back with horrifying consequences in the sixth season. Also because alternate universe episodes are cool, and while this one does center on Cordelia a little too much, it’s still pretty good overall. Synopsis: The series finale. Buffy kills Caleb, minion of the First Evil. The Slayers and the Potentials go to the new Sunnydale High School for the final battle. Willow works a spell that activates all the potential slayers around the world, giving the Potentials the power to win the battle. Anya is killed in the fight. Spike, wearing a mystical amulet, calls down the power of the sun and sacrifices himself to save everyone else. Buffy barely makes it out, running along the roofs of Sunnydale’s buildings (in poorly-done CG) until she can jump for the schoolbus with everyone else on it. In the end, Sunnydale is nothing but a crater and the Hellmouth is closed. As the series fades to black for the last time, Buffy smiles. Notable Guest Stars: David Boreanaz as Angel. It Made The List Because: Truthfully, I found everything after the activation kind of weak. I really felt as though there should’ve been something bigger in terms of a one-on-one fight between Buffy and the First, but then, the First is completely noncorporeal. And Anya’s death was kind of a throwaway, sadly. However, we did have “are you ready to be strong?”, an immensely powerful sequence in the show, and of course Spike’s redemption. Oh, and an appearance by Trogdor the Burninator, who is defeated by Amanda the Potential Slayer. 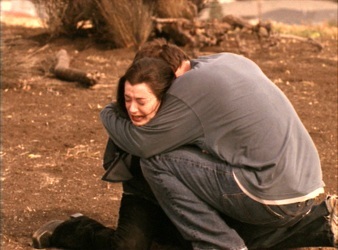 Xander (Nicholas Brendon, right) stops Dark Willow (Alyson Hannigan) from destroying the world. Synopsis: Willow, wracked with grief over the death of Tara, has become Dark Willow, using magic for evil. Spike completes his ordeal in Africa, regaining his soul. Buffy and Dawn are trapped in a pit by Willow, forced to work together to fight against demons Willow raised. Andrew and Jonathan escape to Mexico. Willow, who feels all the pain in the world, attempts to cast a spell to end everything. Only Xander, her oldest friend, can stop her, and despite being attacked he keeps on coming, telling Willow that he loves her and that he’ll be right there with her when she destroys the world. She can’t do it, and she turns back into regular Willow. Anya is quite shocked to find out that Xander saved the world. Notable Guest Stars: Danny Strong as Jonathan; Tom Lenk as Andrew. It Made The List Because: Dumbledore was right: love is the greatest power there is. It stopped the most powerful witch in the world from destroying everything. When Willow finally gives in to Xander, it’s the capstone: an intense, emotional moment in a season full of roller-coasters. Synopsis: Demons called The Gentlemen steal the voices of every person in Sunnydale. Then they start stealing people’s hearts, killing them in the process. 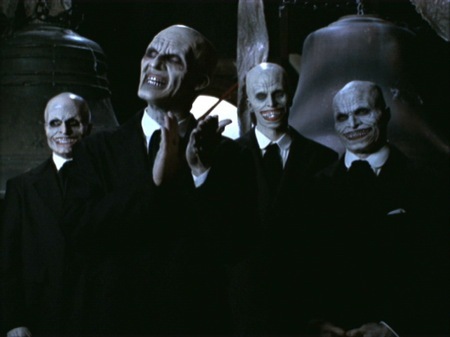 Giles figures out how to defeat the Gentlemen, and Buffy and Riley release the voices of the townspeople. Buffy screams, and the Gentlemen are killed. At the end, Buffy and Riley face each other… and say nothing. Also, we meet Tara. Notable Guest Stars: Phina Oruche as Olivia, Giles’s on-again-off-again girlfriend; Doug Jones, Camden Toy, Don W. Lewis, and Charlie Brumbly as the Gentlemen. It Made The List Because: Do not, under any circumstances, watch this episode in the dark. It is by far the scariest of the series, and one of the best. I actually stayed up and watched a second episode the night I saw “Hush” because I was so creeped out. Buffy prepares to sacrifice herself as her sister Dawn (Michelle Trachtenberg) looks on. Notable Guest Stars: Clare Kramer as Glory; Charlie Weber as Ben; Joel Grey as Doc. It Made The List Because: I added this mostly because of Buffy’s speech to Dawn at the end. Whedon has a habit of doing speeches in retrospect — you don’t hear them until afterward, as a voiceover. Unlike in the first season, when you really don’t know Buffy well enough to care that she’s dead, you feel it in full now, and you see the reactions of her friends and family. A worthy death for a warrior like Buffy… but it doesn’t last. It never lasts. Buffy finds her mother (Kristine Sutherland) dead in their living room. Synopsis: Some episodes ago, Buffy’s mother had a brain tumor removed. Just before this episode, Buffy came home to find her mother dead on the couch. An aneurysm in her brain killed her quickly and painlessly. The main characters attempt to deal with this loss. Notable Guest Stars: Kristine Sutherland as Joyce Summers. It Made The List Because: One of the most powerful hours of television. Ever. No music, no traditional arc of exposition/rising action/climax. Just all of the characters dealing with death. It’s not even so much about Buffy and Dawn’s grief of a child losing a mother. It’s about Willow, who can’t decide what to wear to the hospital; it’s about Xander, feeling powerless in the face of death; it’s about Anya, who doesn’t understand how to react since she hasn’t been a human long enough to face death; it’s about Tara, who’s been through this before and knows that nothing will make the pain go away. Masterfully written, shot, edited, and acted, this episode is probably near the top of every “Best of Buffy” list on the planet. Synopsis: After returning from heaven, Buffy has felt increasingly disconnected to the world around her. She expresses this in the form of a song, much to her surprise. The Scoobies vow to figure out what’s going on. Xander and Anya, soon to be married, sing a duet about what they think is wrong with the other person. Tara serenades Willow. Spike tells Buffy to leave him alone if she’s not going to love him the way he wants her to. Giles says he’s going to leave Sunnydale. Dawn is kidnapped by a demon called Sweet, who is the cause of all the singing. Buffy vows to fight Sweet even though she doesn’t feel the emotions she should be experiencing. After revealing to her friends that Willow pulled her out of heaven, Sweet forces her to dance, almost to her death, but Spike stops her in time. Xander admits to invoking Sweet — he wanted to know if he and Anya would have a happy ending. At the end, Spike and Buffy kiss. Notable Guest Stars: Hinton Battle as Sweet; David Fury as the mustard guy; Marti Noxon as the lady with the parking ticket. It Made The List Because: A musical episode is hard enough without having to advance the plot; one that advances the plot should be spotlighted. Whedon wrote and scored the entire episode (Adam Shankman choreographed it), and every actor on the show actually sings his or her songs. Amber Benson is particularly good in this one, and she’s given a nice little naughty verse at the end of her solo song, as I mentioned in my review of the soundtrack some time ago. Watching this episode after seeing the entire series only underscores just how much viewers care about these characters. From Buffy’s emptiness at being taken from heaven to Spike’s unrequited love, from Dawn’s fear of being unnoticed to Tara’s depth of love for Willow, from Xander and Anya’s odd-couple relationship to Giles’s fatherly feelings toward Buffy, every character on the show receives full attention in this episode, and every one of them is allowed to be funny, or sweet, or sappy, or angry. Between this and “The Body”, you have two of the best hours of television you’ll ever see. Log into Netflix and watch this one right now. And there you have it: my top 25 episodes of Buffy. If you don’t have 144 hours to watch the entire show, you can probably find “must-see” lists all over the internet, but seriously… I made the mistake of not catching this when it was in first-run. I was lucky it was on Netflix and I didn’t have to buy the DVDs. Take advantage, take half a year’s worth of lunch breaks, and watch Buffy the Vampire Slayer. It’ll give you something to sing about. Note to Parents: Although BtVS is only rated TV-PG at its “worst”, the show does contain violence, sexual situations, adult language, and intense action and emotional sequences. I’d say it’s safe for middle-schoolers on up. Of course, you should use your own discretion when it comes to your children.